Adult Women's Hair Loss Treatment | Best treatment to help women experiencing thin, weak, falling hair | Nutritive ingredients to nourish and treat women's hair loss - Luxury Beauty Care Products ! "This nutritive scalp leave in treatment is the best that I have ever tried. Now my hair is coming back. It is healthier and thicker than before." | "It has helped with new growth and makes my hair seems much thicker which is a bonus." | "It does give you some volume, and makes your hair super soft without any oily feel." 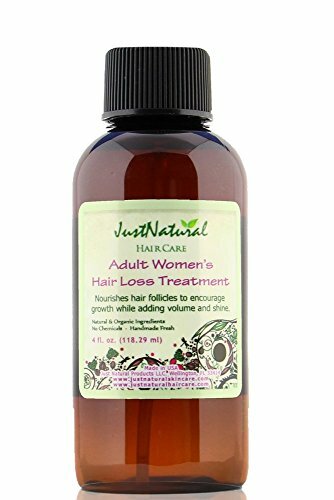 The Adult Women's Hair Loss Treatment is a light weight, easily absorbed blend of vitamin and antioxidant rich oils, extracts, and essentials that deeply penetrate to deliver nutrients that may be lacking. Formulated to repair hair from the inside out and to help restore its nutritive strength, it adds body, shine and manageability while delivering nutritious richness for better hair. Pumpkin Seed and Sea Buckthorn oils are among the new "super fruits" loaded with anti-oxidants, minerals and vitamins. From the Amazon, Andiroba oil has been used by the indigenous tribes for hundreds of years. Combat hair loss by combining our Adult Women's Hair Loss Treatment with our products including Hair Loss Shampoo, Hair Loss Conditioner, and Nutritive Vinegar Rinse. We believe in providing your hair with the nutritive ingredients it needs, without the fillers it doesn't. Our products are free of harsh detergents like Sodium Lauryl Sulfate, Sodium Laureth Sulfate, and synthetic fragrances, and are backed by a satisfaction guarantee. If you are not satisfied with your hair treatment, simply contact us so that we make it right. Purchase your Adult Women's Hair Loss Treatment today and enjoy full, thicker looking hair. RESTORE AND REGAIN: Strengthens against breakage and adds shine with more fullness. This entry was posted in Hair Care on November 4, 2016 by admin.